This story arose from a St Patrick’s Day I won’t easily forget. When I was travelling Australia, I lived with 15 Irish and Scottish people for about five weeks in the Melbourne suburb of Carlton. It was a great period. On March 17 we of course went out to celebrate St Patrick’s Day and had a few drinks. On the way out of one Irish pub, one of the girls dropped her phone down a drain. Another went to retrieve it but got her arm stuck. So here was an Irish girl, Julie, bent over outside the door of an Irish bar, on St Patrick’s Day, stopping traffic, with her arm stuck in a drain. Needless to say the story became nationwide news in Oz with TV and radio crews calling over to our Melbourne squat, while it also gave me a story to send back home for The Sunday Independent. See below a YouTube clip from an Asian station. An Irish woman became nationwide news in Australia on St Patrick’s Day after getting stuck in a drain outside an Irish pub in Melbourne. 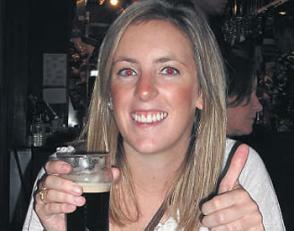 Julie Halton, of Whitehall, Dublin, made national radio, television and print media down under after getting her arm caught in the drain outside Father Flanagan’s bar in the city’s Fitzroy suburb. Ms Halton was trying to retrieve a friend’s mobile phone at the time when she found herself unable to free her elbow from the storm drain. The incident occurred about 8pm local time last Tuesday, in the midst of St Patrick’s Day celebrations. Fire fighters at the scene were forced to use the jaws of life, a huge tool commonly used to free people from mangled cars and burning or collapsed buildings, to free Ms Halton. The 23- year-old, who has been in Australia since December, was not injured in the incident, though the rescue scene — which saw a number of fire brigade trucks and police attend the scene — caused at least one minor car accident from passing onlookers. Within minutes, TV news crews and newspaper photographers appeared to capture the unfolding events. The bizarre story caught the imagination of the Australian media with the story featuring on national television stations, Channel 9 and Channel 10. It also appeared in Australia’s largest selling daily newspaper The Herald Sun as well as Melbourne-based broadsheet, The Age and popular radio show The Hamish & Andy Show. Ms Halton was even asked to have her photograph taken with ‘Sam the Koala’, famous for drinking water from a fire fighter’s bottle during the recent Victorian Bush Fires. “It got a ridiculous amount of coverage here,” commented Ms Halton. “I mean I was totally shocked really. It even made the news in Asia as well. It was crazy. Of the incident itself, she added that “it was one of the highlights of my holiday here to be honest! I mean it’s all a bit of craic, a bit of banter. You have to laugh about these things. Afterwards I went back into the pub for a few pints and laughed it off. In all seriousness, though, I have to say a huge thank you to the emergency services here and the Melbourne fire brigade. They were brilliant about it all. It was a much bigger job than you’d think”. Ms Halton was trapped in the drain for over two hours as steel re-enforcing in the concrete made it difficult to free her. Melbourne fire fighter Darren McQuade joked that “to have an Irish woman with her arm trapped down a drain outside an Irish pub, well it’s probably got to be St Patrick’s Day”.